It's been six months since we've sent out a newsletter. Sorry about that. This will hopefully explain things and bring you up to date. Two unfortunate events occurred at the end of October 2004. 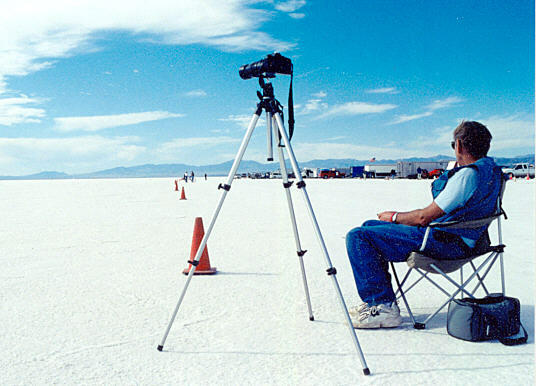 The first was Alan's crash at 195 mph, during World Finals at Bonneville Salt Flats. During Alan's run, the car was pulling hard to the right. He counter by turning harder and harder to the left. At about the 4 mile mark, the car became uncontrollable, as he tried to slow down, the car spun to the left. As it came around, the rear axle cracked at the right wheel hub and that tire broke off, the canopy blew off the car. As the car continued to spin, the left wheel came off the same way. The car then swung back the other way, went all the way around, before finally rolling over. As it rolled over, the scoop was scraped off, and we lost a front wheel. After a couple of slow, smooth rolls, something dug in, and the car went over hard a couple of times, scraping the nose off. Finally, it rolled over slowly one last time before rocking to a stop upright. 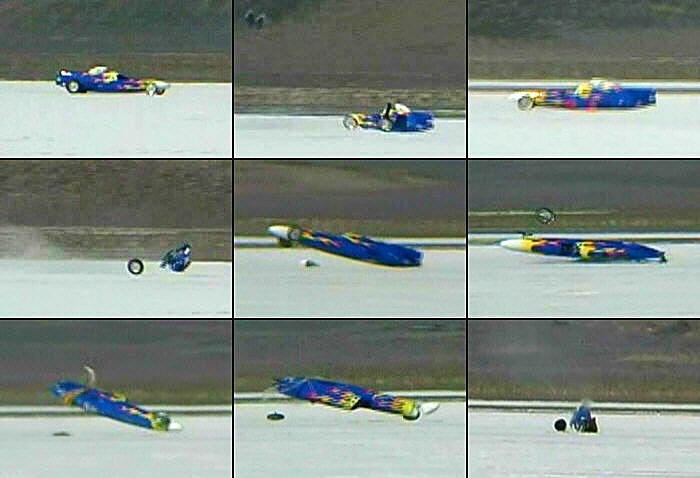 (The crash video was shot by Mark Brazeau of Land Speed Racing Video and is available here.) The safety equipment worked perfectly and Alan walked away unhurt (he was a little sore the next day) the same could not be said for the car. Most of the car was structurally intact, (in fact the engine was still running). But several, critical things were damaged or destroyed. Some, like both axles were obvious right away, others, like the rear frame and the steering box, we didn't discover until later. More on that below. The second unfortunate event in October, was that James & Alan's father, Phil Rice, passed away from cancer. Obviously that put a serious damper on things, and family obligations took precedent over any thoughts of repairing the car. When we finally got back to looking at the car, we discovered that it was quite a mess. It had sat in storage, without cleaning, since the accident, so there was lots of salt and some corrosion. Our first step was to disassemble, clean, and inspect each part of the car. The relatively intact car started to look a lot less so. Initially, we thought the frame had remained straight, but after carefully measuring, we found the frame around the engine was slightly tweaked. This part of the frame was intentionally made weaker that the driver's cage, so that stress could dissipate by deforming metal there before it deformed the roll cage. This seems to have worked. But it also meant that the bent tubing needed to be replaced. These repairs required removing the lower body, which is a major job, but would probably have been needed anyway. At least with the body removed, we could see everything. 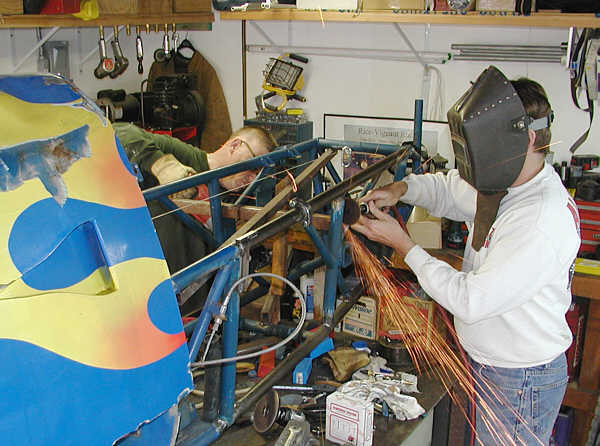 Once the car was comply stripped down, the frame was clamped onto Mark's welding table where it was easier to move around, at a comfortable working height, and less in the way in the garage. Mark & Alan working on the frame. The inventory of parts that were repairing or replacing has grew very long. The front axle, steering box, wheels, and everything else related to the front end was bad. 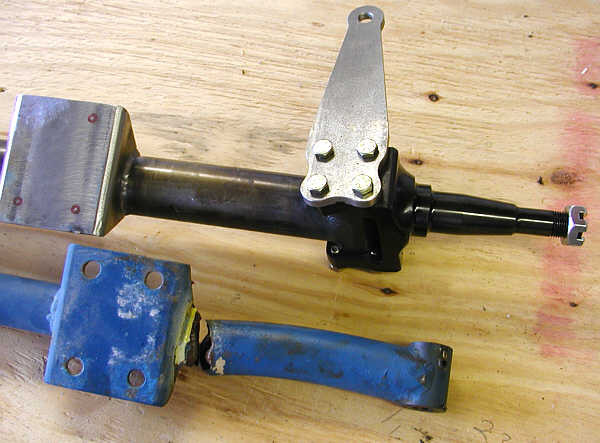 Only the steering box was salvageable, but needed to be completely disassembled, welded and rebuilt. The entire rear axle, and rear suspension needed to be replaced. At least the rear wheels were OK, although one was found a mile from the accident. The left side of the frame around the motor had to be cut out and replaced. Part of this we were going to do anyway, so we could change motors easier. The amount of body work needed is so enormous, that we haven't really considered it yet, but we know the canopy must be rebuilt, the nose hammered back into shape, and reattached. (or maybe just replaced). The scoop was scraped off but it is otherwise undamaged. The body around the driver has several wrinkles that need to be fixed. The rear engine cowling survived rather well, only getting a couple of small holes, loosing the scoop, and one Dzut button. (It stayed attached during the accident). 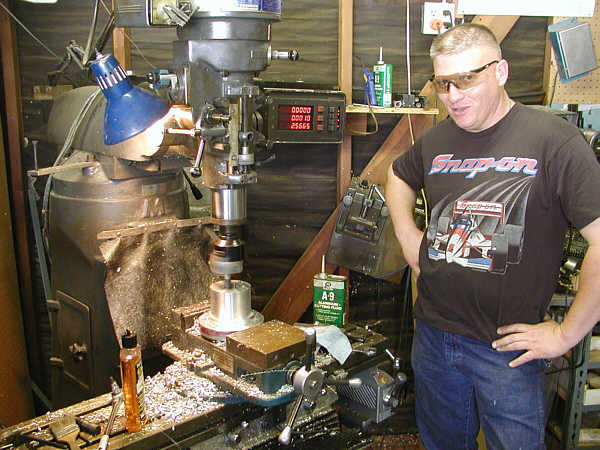 Mark machining the new rear wheel hubs. The longest lead time items are the axles. We stared designing new hubs for the rear, to fit on a new, stronger axle, that doesn't taper at the ends. The machining on these parts is taking a long time. The front axle went faster. We just ordered one. It came in quickly and has been installed. We found two used front rims, very similar to the ones that were destroyed. The frame has now been fixed. Next up is rebuilding the rear suspension, and continuing the machining on the rear axle and hubs. It looks like we won't be ready to run until this fall, and even then, I doubt the body work will be done. That may have to wait until next spring. The new front axle (top) with the old broken one. Our company, ChronoLogic Timing has timed a couple of private meets over the last few months, If you saw the Monster Garage with the Belly Tank lakester, driven at Vandenburg AFB, that was us timing it. Alan and I, (but mostly Alan), are working on a new data-logger, tentatively called "DataLogic". Our goal is a cheaper & easier system than anyone else has out there. The work is going slow, but we should have a fully working prototype running within a few weeks. All the individually pieces have worked, so now we just have to combine them. The first race of the season is this weekend. It is planned to be a two day meet at El Mirage, assuming the lakebed is dry enough. If you plan on attending, please remember how dangerous El Mirage can be. Don't take safety for granted. Keep your speeds down, always keep a sharp eye out for other vehicles and idiots. Bring shade and water. If you get the chance, swing by the tower and say "hi".